Not many styles can provide both ruggedness AND sophistication but the Olde English does it. Incorporating elements of the Full Beard, Door Knocker and Muttonchops, the Olde English Beard provides full facial coverage, while highlighting the cheekbones. Stop shaving for three weeks to see if your beard has any patchy or sparse areas. While continuing to grow your beard for several weeks, begin to add some desired shape and trim the edges along the neck and cheeks with your Wahl® trimmer. Using your trimmer, trim away the extra-long whiskers to create a uniform length on your cheeks and sideburns. Many choose to wear the Olde English with thick growth. Using your trimmer, trim straight, vertical sideburns, stopping approximately one inch above jawline. Using your trimmer, create a vertical line of hair about half-inch wide from the corner of the mouth to your chin. Do the same on both sides, paying close attention to keeping them even. 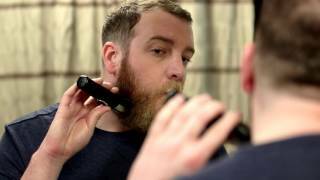 On the neck, use your trimmer to create a subtle border where your whiskers become visibly sparse.